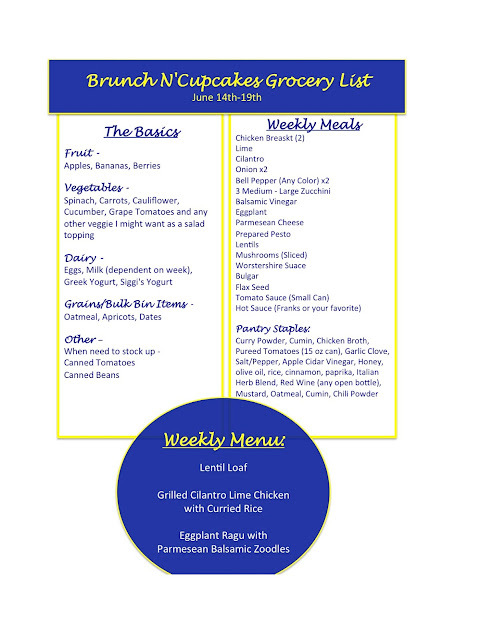 Sorry to be posting the weekly shopping list and menu just a tad late! The weekend and time seemed to have gotten away from me! Derek and I spent most of the weekend outside (despite the rain on Saturday morning) enjoying the beautiful weather, and a few "firsts" when it comes to summer activities in Minneapolis! Friday night we took in a movie at the local Drive in Theater (yes, there is still one in Minneapolis) which was an experience, but so much fun! They played three newer films (Jurassic World, Pitch Perfect 2, and San Andres). And Saturday we enjoyed a BBQ with friends before checking out Rock the Block (a outdoor concert in Uptown) and Northern Spark 2015 (a art/musical festival that takes place all over Minneapolis throughout the night, it ends at 5 AM on Sunday Morning)! It was a blast of a weekend! But lets get talking about this weeks meal plan and shopping list! This week I focused on a few meals that I think would be perfect to show dad how much you care(since Father's day is this Sunday)! A lightened up vegetarian version of meat loaf, a flavor filled grilled chicken and a chunky eggplant ragu that I serve over zucchini noodles (but serve over pasta if you prefer)! There will also be a bonus recipe that is sweet, and perfect for brunch (at least I think so)! So without further ado, your menu! Note - You get a lot of leftover Ragu which is great on top of brown rice or stuffed inside peppers as a stuffed pepper stuffing! !